Saturday, May 25, departing at 7:15am (6:45am from the subway). Cost: 450 RMB (405 RMB for members); Difficulty Level 5. 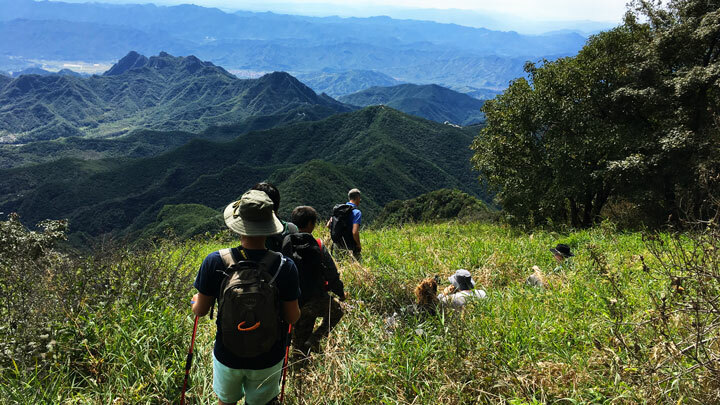 In Brief: A variation of our tough hike up to the craggy peak of Heituo Mountain that finishes by hiking out below the tall cliffs on the Nine-Eyes Tower side of the mountain. A craggy ridge near the peak of Heituo Mountain. 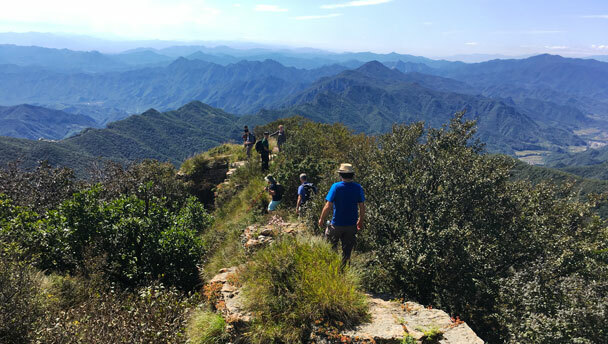 Make the long slow climb up to the saddle below the 1503m peak of Heituo Mountain, and then take on the steep climb to the top. We’ll finish the hike by walking down and out below the tall cliffs on the Nine-Eyes Tower side of the mountain. We’ll start the hike in a tiny farming village by the roadside, and follow a concrete fire service track up into the mountains. After about 2km of concrete, we’ll make a little scramble to get on to the track that leads through forest up towards the peak. The forest track is good walking: a well-formed dirt trail that is mostly clear of close vegetation. 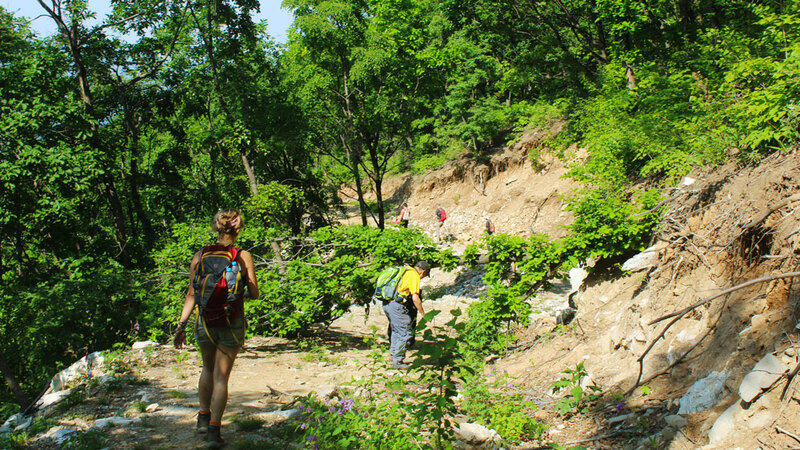 As we hike up through the forest we’ll have views of the peak and the other mountains around the Jiankou Great Wall. We’ll get up on to a fairly flat trail along the saddle below the peak, and we’ll be able to catch our breath before we take on the big climb up to the summit. The track starts getting seriously steep here, and goes up about 225m over just 600m of trail. But it’s worth the effort—the views from the top are amazing on a clear day, with the Jiankou Great Wall far below, reservoirs and lakes seen farther out, and maybe a glimpse of Beijing’s CBD in the far distance. We’ll take a rest in a grassy meadow near the peak, and start getting ready to hike down the other side of the mountain. 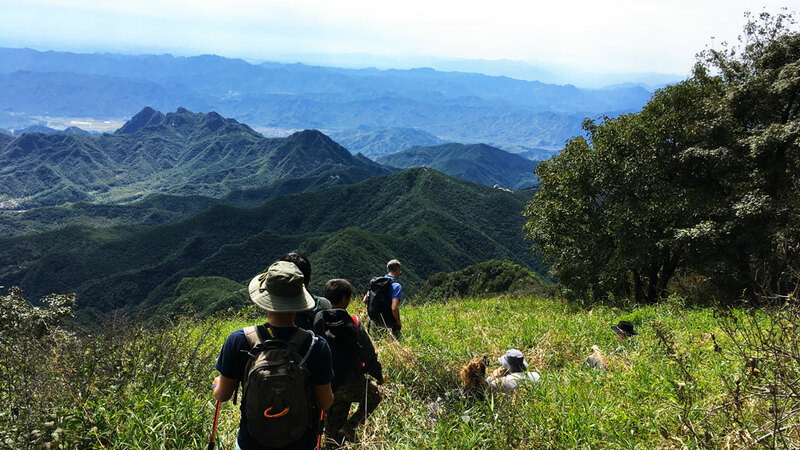 The trail crosses over the craggy ridge of Heituo Mountain’s peak, and then we start the steep descent down the south side of the mountain. On the south side of the peak is a crossroads in the trail. On this hike we’re going to take the turn that leads towards Nine-Eyes Tower instead of continuing down into the wild Valley of the Pigs. Steep descents on poorly-formed trails. Level 5 hikes are physically challenging, and suitable for experienced hikers in good shape.